In a summer that’s been dominated by sequels and adaptations, it’s always nice to see a new IP like Elysium hit theaters. Disguised as a sci-fi thriller, the film attempts to intertwine sweeping social commentary with colorful, interstellar action amid a rich and visually stunning backdrop. The film’s predecessor, District 9, set the bar high with it’s thematically strong yet engaging story. 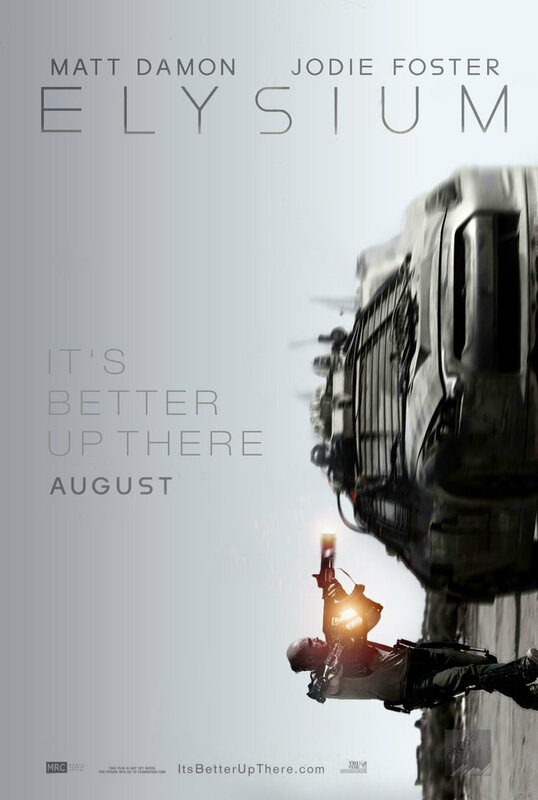 So much so, in fact, that many now wonder if Elysium will be able to live up to the hype. Coming to us from South African director Neill Blomkamp, Elysium is the sophomore entry in this skilled director’s resumé. As with District 9, Blomkamp attempts to present a somewhat realistic portrayal of a diseased and war-torn Earth, which contrasts impressively with the sleek futuristic design of the space station. Admittedly, the film incorporates some genuinely impressive visuals, and with Blomkamp’s own extensive experience in 3D animation and design, it’s no surprise that his work reaches the zenith as far as aesthetics and CG are concerned. Starring Matt Damon and including cameo appearances by Jodie Foster and Sharlto Copley, Elysium follows the story of Max (Damon) who, due to an industrial accident, finds himself with only a few days left to live. Out of desperation, Max teams up with a hacker and attempts con his way into Elysium in order to receive the medical treatment necessary to heal him. Naturally, mayhem ensues and Max is ultimately embroiled in a conspiracy to overthrow the government of Elysium. The acting here is more or less solid all the way around with the standout being Sharlto Copley as the deranged sleeper agent Kruger. Copley, you may remember, was the standout star of District 9 as the goofy yet earnest Wikus Van Der Merwe, and his transformation here is not only jolting but extremely impressive, especially considering his relative newness to the industry. More interesting still is the fact that Eminem was originally offered the role of Max De Costa, though he insisted that the film be shot in Detroit which ended up being disagreeable to some of the studios involved in production. Despite the many things that the film does well, it still has its share of problems. For instance, I’ve heard it said that some of the scenes intended to be a commentary on societal issues are obnoxiously heavy handed and obvious. While I can say that the masses on Earth are a rather obvious metaphor for immigrants (Spanish being the preferred language, individuals being referred to as ‘undocumented’- that kind of thing) I didn’t think that it detracted from the film to any significant degree. What did detract from the film, however, were the weird, unexplained plot elements. In short, the film suffers from a severe case of Super Blood Syndrome. What I mean to say is that a hugely important, plot critical piece of technology is introduced, but no effort is made to explain how it works or how it can feasibly exist within the confines of the narrative. Like the inexplicable “super blood” found in Star Trek: Into Darkness, Elysium introduces a kind of vita chamber or med bay which can cure any illness or malady instantly. This technology is ostensibly cheap and efficient but is nonetheless kept out of the reach of Earthbound citizens for no other reason than pure, unadulterated greed. Honestly, the simple truth is that it doesn’t make any sense, and unfortunately, my engagement in the story suffered as a result. All in all, Elysium is a beautiful looking, well acted exercise in sci-fi, let down by some unfortunate plot issues and character motivations. Though it doesn’t quite live up to the wold-shattering success of District 9, it remains a pretty enjoyable experience mixed with a poignant message about those who have and those who have not.